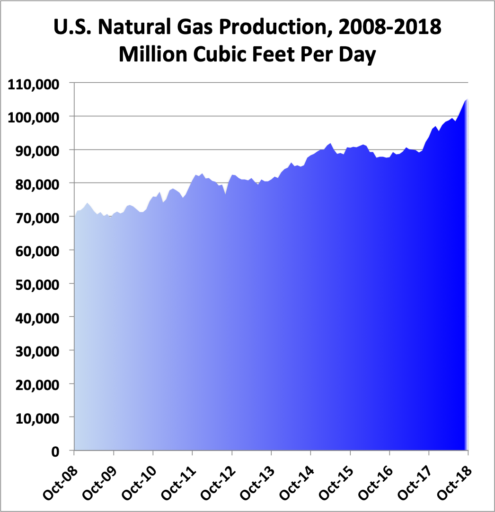 The EIA’s “Monthly Crude Oil and Natural Gas Production” report for October, 2018 is out and one map, one chart and one table tell the wonderful story of the shale revolution. It is a glorious one, indeed. 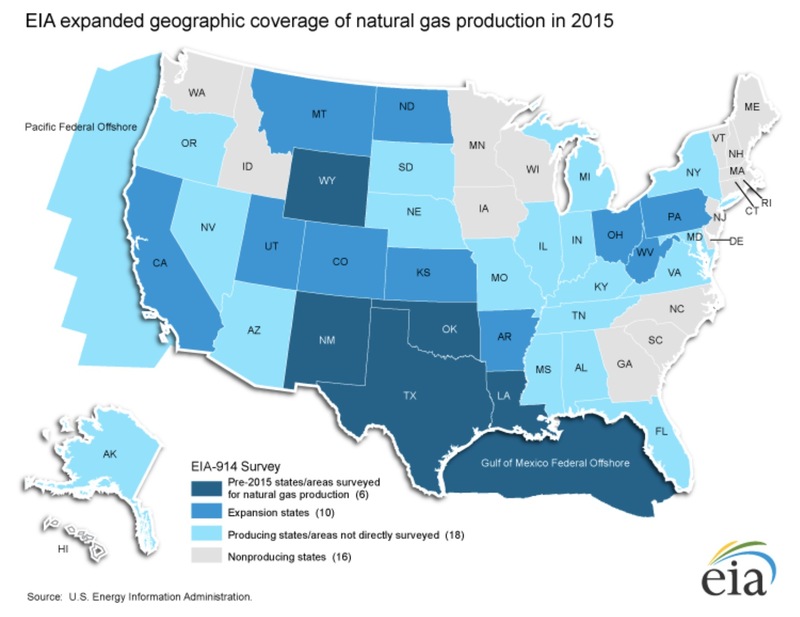 The thing to notice about this map is this; pre-2015, the EIA only kept detailed track of natural gas production in five states. Those were Texas, Oklahoma, Louisiana, New Mexico and Wyoming. Then came the Appalachian miracle and the companion Bakken miracle, both a result of the glorious shale revolution as fracking combined with horizontal drilling changed the game forever. 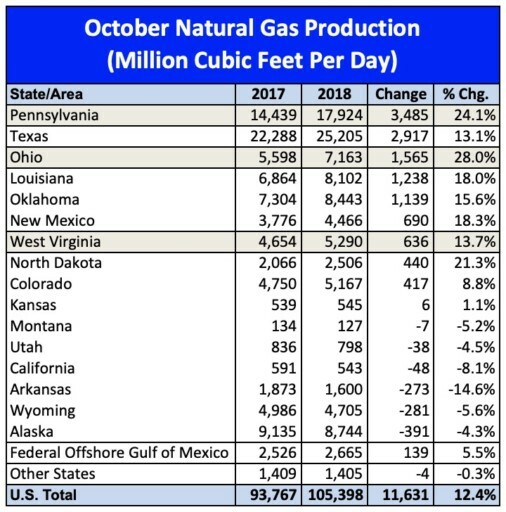 Yes, Pennsylvania added nearly 20% more in natural gas production than Texas. It is the No. 2 producer and will overtake Texas in 2022 at this rate. Ohio and West Virginia are adding more gas proportionally than Texas, as is North Dakota. It’s the shale revolution, baby! Just amazing. After decades of wondering how to make it happen, it has, all by itself, thanks to technology. Thank fracking. Impressive growth rate of 15% / year. Very good news for the US and its citizens in terms of economic, environmental and social benefits. Mountaineer Xpress should have about 700 MMcfd online any day now. Total capacity is near Rover like 2.7 Bcfd, which should be at max within a few months. Atlantic Coast and Mountain Valley will overcome obstacles within a year’s time and add an additional 3 Bcfd or so takeaway capacity. Future build out is likely as massive CCGT plants come online down that way. Greenville county plant that just opened is one of the biggest yet at near 1,600 Mw. XTO (Exxon) has just quietly taken out a handful of Deep Utica permits in Jefferson county, northeast of Pittsburgh, after drilling one modestly successful Utica in the area. 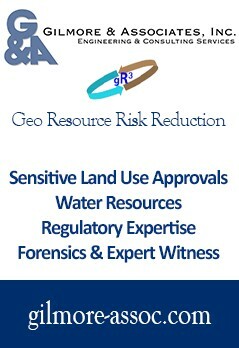 Eventually the Utica production may rival the Mighty Marcellus’. Your New England neighbors are on the cusp of both a ridiculous – and VERY precarious – power situation as the badly needed transmission line through Maine may be shot down. Ditto the offshore wind boondoggle as a permitting decision end of January by RI regulatory body does not look promising. The Mariner East 1, 2, and 2X will have huge impact on southwest and northwest Pennsylvania (and West Virginia) production as the wet gas areas’ production will be largely unconstrained. Appalachia Rising if you all prevent the obstructionist from holding sway!